Ash-e-Reshteh is traditionally served in March during Nowruz, the Persian New Year, but I could eat this soup anytime, especially since we're having March-like weather in June. This soup is so healthy. It's full of protein, fiber and antioxidants with all of the legumes, leafy greens and herbs. And it actually tastes better the following day, but that assumes you will have leftovers, which I doubt you will. The key to making this soup is not to overcook the greens to keep the flavors and colors fresh and vibrant. I added the leafy greens to each individual serving bowl and ladled the hot soup over top. The temperature of the soup wilts the greens slightly, and retains their beautiful color and texture. 8 oz thin egg-free noodles. I used fresh Ramen noodles. If using dried beans, soak overnight in individual bowls, drain soaking water, add fresh water to cover and cook beans separately until tender, making sure not to overcook. Drain beans and set aside. You don't need to soak the lentils overnight, they take only 20 minutes to cook. If using canned beans, rinse and set aside. In a large stock pot or dutch oven, heat 1 1/2 tbsp olive oil and cook onions and garlic until soft. Add spices, vegetable stock, beans/lentils (except fava beans), herbs, salt and pepper to taste and bring to a boil. Reduce heat to a simmer and cook for about 30 minutes. While soup is cooking, cook shallots in remaining olive oil until caramelized and set aside. Cook noodles according to package directions, drain and keep warm until ready to use. Blanch fava beans for about 1 minute, peel skins and set aside. 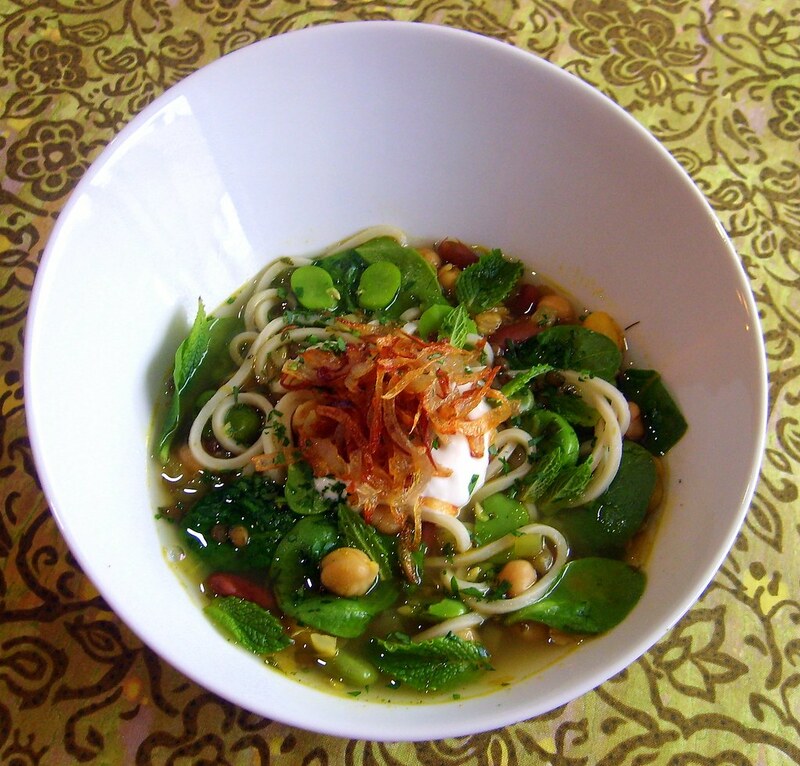 Portion out noodles into bowls, add a handful of spinach and a 1/4 cup of blanched fava beans to each bowl. Ladle over hot soup and garnish with sour cream, shallots, mint leaves, minced herbs and a squeeze of fresh lemon juice. Enjoy!